The Bayer family (back row, left to right) Jestin, 13, RJ, 15, Jade, 11, (front row) Jamie, Reagan, 7, and Ryan. When Ryan Bayer was diagnosed with an inoperable brain tumor driven by a rare, devastating genetic mutation, doctors told him the malignancy was invariably fatal, usually within a year. Today, scans show only a vestige of the cancer. Bayer, 38, no longer has right-side numbness or other disabling symptoms. 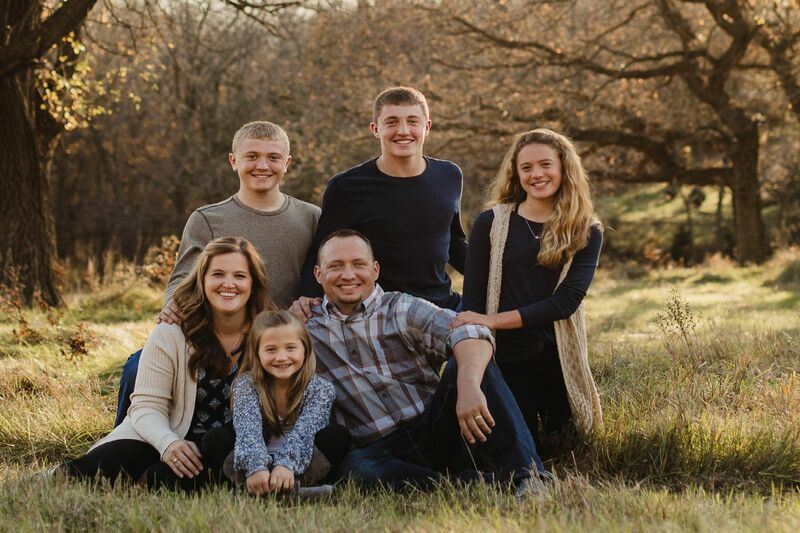 He has resumed his busy life as husband, father of four, insurance agency co-owner, and part-time farmer. The turning point came a year ago when he went on ONC201, an experimental oncology drug being developed by Philadelphia-based Oncoceutics. It works, at least partly, in an unprecedented way: by blocking dopamine, the chemical messenger best known for its role in the brain’s reward-and-pleasure circuitry. ONC201 comes in capsules that Bayer pops once a week, unlike the grueling rounds of radiation and intravenous chemotherapy that caused hearing loss, infections, digestive problems, and other serious side effects. “It’s been nothing short of amazing for him,” said Nicole Shonka, the University of Nebraska Medical Center neuro-oncologist who got the drug for him. As remarkable as Bayer’s recovery is, it has to be put in context. Company officials gave him the drug under a compassionate-use program for desperately ill patients, not as part of a clinical trial that could produce data needed for U.S. Food and Drug Administration approval. And researchers are still deciphering how ONC201 works. It was largely ineffective in a pilot trial of patients with glioblastoma, the most common adult brain cancer. Still, the compound is looking like a lifeline — the first effective drug ever — for a subset of brain cancer patients who, like Bayer, have the rare, aggressive mutation called H3 K27M. Last month, researchers presented data on 26 such patients treated in clinical trials. Brain tumors stopped growing in 14 patients — more than half — with follow-up ranging from two months to more than two years. Seven of them, including two children, have done even better, experiencing tumor shrinkage or relief of neurological problems, or both. In two adults, the regression has been so complete that the remaining traces may just be scars. The story of ONC201 begins in 2008. Oncologist Wafik S. El-Deiry, at the time a University of Pennsylvania professor and the scientific founder of Oncoceutics, led an effort to screen a large federal library of chemical compounds. His team wanted to discover a substance that could persistently kill many types of cancer cells — but spare normal cells — by activating a crucial immune system pathway that selectively causes cell death. While that was a tall order, the scientists knew a lot about the cell death pathway: El-Deiry’s lab at Penn had discovered it a decade earlier. “We wanted to find ways of triggering this pathway,” said El-Deiry, who is now deputy director of translational research at Fox Chase Cancer Center. Wafik S. El-Deiry, scientific founder of Oncoceutics and a deputy director of Fox Chase Cancer Center. In 2013, while at Penn State University, they published a paper describing the compound they identified, which was even better than they hoped — at least, in lab dishes and animal studies. ONC201 had the rare ability to penetrate the dense barrier of blood vessels that protect the brain. And its chemical structure had neat spots to attach additional molecules, opening the door to creating a whole class of cancer-fighting drugs. Still, some aspects of the compound were mysterious. The researchers knew how it killed tumor cells, but not what triggered the process. Where did it interfere in tumor cells to turn on the cell death machinery? For clues, Oncoceutics chief executive officer Wolfgang Oster enlisted a Cornell University team to do high-tech computational analyses. The results pointed to a novel mechanism, never before targeted in oncology: ONC201 locked into a binding spot, or receptor, for dopamine, the neurotransmitter involved in mood, memory, and movement. That, in turn, reduced dopamine signaling. Separate research going on around the same time found it made perfect sense. The dopamine receptor is overproduced by several types of cancer, including glioblastoma. Certain malignant brain cells, it turned out, amped up dopamine signaling to help them grow faster. “Dopamine is a pathway for nerve cells to communicate that can be abused by malignant cells to enable them to grow out of control,” Oster explained. There is also circumstantial evidence of dopamine’s role in cancer. Parkinson’s disease patients — who have a dopamine deficit — have lower risks of various cancers, including brain cancer, studies show. Logically, blocking dopamine might have psychological side effects, but that doesn’t seem to be a problem with ONC201. In 2014, Oncoceutics launched a clinical trial of ONC201 in recurrent glioblastoma at three of the nation’s leading cancer centers. The pilot study, published last year, was cut short because tumors in most of the 17 patients continued to grow. However, one patient — a 22-year-old woman treated at Dana-Farber Cancer Institute in Boston — had an astounding response. Analysis of her tumor sample revealed H3 K27M. Now, 2½ years later, she is finishing college, her disease all but gone, said Dana-Farber neuro-oncologist Patrick Y. Wen. “Until now, nothing has worked for this subset of patients because this cancer is the worst of the worst,” Wen said. Indeed, the World Health Organization in 2016 created a separate classification for these mutation-driven “gliomas.” Although rare — about 1,500 cases are diagnosed each year in the U.S. — the cancer disproportionately strikes children and young adults, and is usually inoperable because it arises in the middle of the brain. While killing cancer is the goal of any therapy, ONC201 has relieved debilitating symptoms in some glioma patients whose tumors stopped growing but did not regress. Caitlin Boyle Wetzel, 27, of Stockbridge, Mich., is elated to be an example. The veterinary assistant was diagnosed a year ago. Her tumor blocked drainage of her cerebrospinal fluid, causing savage headaches, double vision, vomiting, and crippling fatigue. She had surgery to place a drainage shunt, massive doses of steroids, radiation, and Temodar, the standard chemotherapy for brain cancer. Her tumor kept growing relentlessly. But it stopped after she went on ONC201 in March. Wetzel got married this summer, honeymooned in Hawaii, and recently returned to work part time. Last month, the FDA gave “fast-track” designation — intended to expedite the development of therapies for deadly diseases with unmet need — to ONC201 for treatment of the mutation-driven glioma. Oncoceutics’ scientists hope the glioma is just the beginning. ONC201 is now in trials for a number of cancers.